A fire broke out on the site of the Scarborough Renaissance Festival on August 22nd just after 10:30pm. By the time firefighters arrived seven structures were engulfed including a small cabin where caretaker, Will Ross lived on the property. The fire burned a portion of the park known as Holly Field. Festival spokesman Orvis Melvin says investigators are trying to determine what started the blaze Monday night at the complex near Waxahachie. Melvin said about seven other workers were on the property when it happened and they used the water from the Renaissance fair water trucks to spray the nearby structures and trees until the firefighters arrived. Six fire departments responded to the scene. One firefighter was injured and treated for heat exhaustion. "It took a while to get the fire cooled down enough to be able to go in to do any searching," said Lt. James Saulter, Ellis County Sheriff's Office. "Once they got it down, it took them about five minutes before they located the victim who was inside." "We lost seven shoppes including the Holly Field privies and the Holly Field Souvenir Shoppe," Melvin says "The entire upper lane, from the privies to the Legendary Candle Booth, burned to the ground." 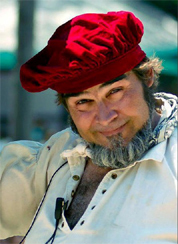 Melvin says the 2012 Scarborough Renaissance Festival, set for April 7 through May 28, will be held as planned. "Fortunately, we don't have to do Scarborough Renaissance Festival until next April. We should have all these buildings replaced by then," said Melvin. "There was no significant damage to the Crown Meadow, so Screams® will not be affected." Screams is a Halloween festival held in October on the site. A Memorial service was held on Tuesday, August 30th for Will Ross, also known as the Pickle Man, since he sold pickles at he fair. Friends and family gathered before dusk on one of the park stages to share their memories of this gentle man. The eulogies were followed by a potluck dinner. After the Memorial Kataz Trophe wrote, "I think Will's family was overwhelmed by the outpouring of love for Will. I spoke to his Dad for a few minutes, he told me a story, and concluded by saying 'For 10 years before Will started here, he was a lost and troubled man. This place—and all the people in it—saved Will's life and his Soul.'"